First responders, government officials, environmental experts, and commercial companies are using GIS to monitor the BP-operated Deepwater Horizon MC252 oil spill in the Gulf of Mexico and identify potential impacts to natural resources. GIS analysis and data help response agencies collaborate by increasing their situational awareness to support command and control. As the event unfolds, agencies will be able to make better decisions to manage the spill's repercussions. GIS technology supports incident management efforts through delivery of current and accurate information to response agencies using a powerful common operating picture (COP). The Esri oil spill map application enables people to add geospatially referenced tweets, photos, and YouTube videos. This allows information captured from the Gulf Coast to be shared around the world via the Web. 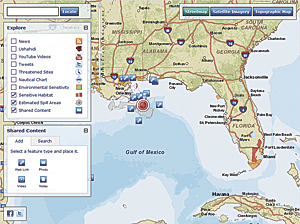 In the Gulf of Mexico, Esri is working closely with dozens of agencies and the GIS community. Esri's disaster response team is providing assistance to users in local, state, and federal government agencies, as well as in the private sector. The team is supplying software, technical support, GIS data, and personnel. Dozens of agencies have responded with GIS support. Members of the Spill of National Significance (SONS) used GIS to compile and consolidate information in a spatial context, providing incident command with a COP. "Since the spill is accruing over a large geographic area, various analysis techniques are being employed to verify placement of boom assets used to mitigate the effects of oil upon the shoreline," says David Gisclair, technical assistance program director, Louisiana Oil Spill Coordinator's Office. "By using GIS technology, field information can be processed into products useful in the incident command decision-making process." Devon Humphrey, geospatial intelligence officer and instructor, Texas A&M University, Corpus Christi, discussed how he and his staff came to help. "We see ourselves as kind of �GIS smoke jumpers,'" says Humphrey. "We have come in to fight the spill and will get things set up so that others can rotate through over the next several years. The plan is for these GIS professionals to train replacement GIS staff as they rotate through the Houma command post and provide them with certification from the National Spill Control School at Texas A&M University. The training will be conducted here in the GIS Lab and will include a combination of GIS for oil spill and National Incident Management System (NIMS) training required to work on this spill." The GIS section at the incident command post, located in Houma, Louisiana, coordinated by Humphrey and his team, was able to collate all collection data (imagery or otherwise) from state and federal agencies on oil boom and oil slick information. All this information was visually posted in such a manner (maps/imagery) to allow for rapid assessment of the situation in the field by senior leadership. "GIS folks were able to rapidly change layers of information to match user needs," says Lt. Col. Roy Worrall, Incident Awareness and Assessment (IAA), supporting civil authorities, U.S. Army National Guard, "for example, building a product for the state leadership that reflected information on engineering projects, such as breakwaters, tiger dams, and sandbagging operations. All of this was done on a daily basis, and products were updated continuously as information became available." The engineering, construction, and technical services firm URS Corporation has been working successfully using GIS to provide data management and decision support to the myriad of businesses and government entities responding to the oil spill. "The coordination of spatial data for so many agencies, companies, and entities is daunting at best," says Eric Songer, GISP, URS Corporation. "Every federal agency dealing with natural resources is present, as well as the state agencies of four different states, and all the contractors brought in to help with the response. There are dozens of entities, all with varying degrees of spatial awareness." Lynn Ford, GIS manager for the Alabama Department of Environmental Management, says, "Alabama is using ArcGIS Mobile 10 to collect the locations and condition of deployed boom. The application allows the marine police and marine resources officers to stream GPS coordinates to a laptop, attribute the line, and edit the attributes. The data is sent to a server in near real time to provide the data to the planners." Esri is also providing support and services for the Gulf oil spill through its disaster response Web site. Resources available include continuously updated maps, data, and applications, as well as links to incident-related Web sites. These resources provide the response community with tools to anticipate any adverse effects and respond proactively. As part of its Web site, Esri launched an interactive map application that allows users to add volunteered geographic information (VGI) in the form of links to online photos, Web sites, and YouTube videos. By doing so, volunteers can add current information to the map and increase everyone's awareness of activities related to this tragic event. Services include an oil spill plume trajectory model, an environmental sensitivity index map, and electronic navigation charts. For more information, contact Geoff Wade, Esri (e-mail: gwade@esri.com), or Russ Johnson, Esri (e-mail: russ_johnson@esri.com), or visit the Esri disaster response Web site at www.esri.com/services/disaster-response.